"We interrogated them, made an agreement, paraded them around the island and forced them to leave Gili," Officials said. 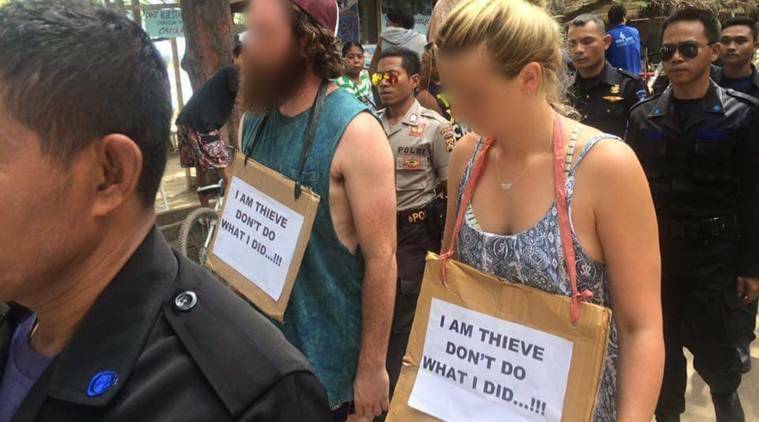 Two Australian tourists accused of stealing a bicycle have been forced to take a “walk of shame” through an Indonesian island with signs round their necks, an official said today. “I am thieve (sic). Don’t do what I did,” the signs read. The tourists, whose identities were not revealed, allegedly stole the bicycle about 10 days ago on Gili Trawangan, a popular tourist destination in central Indonesia. CCTV recordings showed the two Australians taking a bike from the hotel, said village chief Muhamad Taufik. The hotel manager reported the case to the authorities who caught the pair the following day, Taufik added. “We interrogated them, made an agreement, paraded them around the island and forced them to leave Gili,” Taufik told AFP. The two were the first foreigners this year to undergo a “walk of shame” on the island. A few Indonesians have been forced to take part this year in similar parades for theft. National laws are in force on the island but it is unclear whether the Australians underwent a formal police investigation. “The walk of shame parade is a regulation in our village. I don’t know whether the police are charging them now, what matters to me is that they’re now gone,” Taufik said. Such parades have taken place for years on Gili Trawangan, a tiny island off the coast of Lombok and just east of the major resort island of Bali.